CLOSE TO TWO-THIRDS of households in Ireland are borrowing money to pay for essential bills as thousands find the high cost of energy “increasingly unaffordable”. A new survey has revealed a rise in consumers turning to credit cards or dipping into savings. Research from switching service uSwitch.ie shows that 45 per cent of consumers find their energy bills a source of “major financial pressure”. 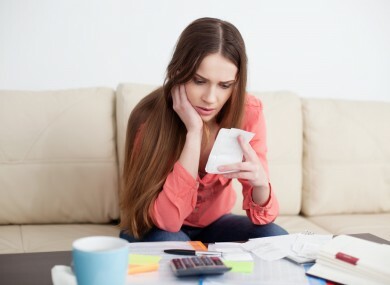 Around 50 per cent of households are turning to credit cards and overdrafts, an increase from 43 per cent in 2012. There has been a 6 point increase from the previous survey to 63 per cent in the numbers using their savings or getting help from family and friends. Head of uSwitch.ie Eoin Clarke said the figures show no relief for households struggling to make ends meet. “Consumers are continuing to find themselves under huge financial pressure, with the rising costs of living, rent and mortgage payments, leaving some people overwhelmed with bill worries,” he said. Over half find increases are significantly impacting on disposable income. Our research shows that the average energy bill has rocketed by over €500 per year in the last three years alone, due to the increase of unit prices and standard charges. “Increased competition in the market has prompted energy suppliers to act quickly and launch more competitive offers,” he added. The survey was conducted by Coyne Research and interviewed 1,000 adults online. Email “More households borrowing money to pay "increasingly unaffordable" energy bills”. Feedback on “More households borrowing money to pay "increasingly unaffordable" energy bills”.